In term to steps closer to achieve its goal in 2040 as Socio-Preneurial University and 300 World Class University, Universitas Muhammadiyah Yogyakarta conceived that there a lot of things to prepare in the way be there as it is targeted. One of the issues that should be faced on the way there is unstandardized International Program that commonly happened in present. 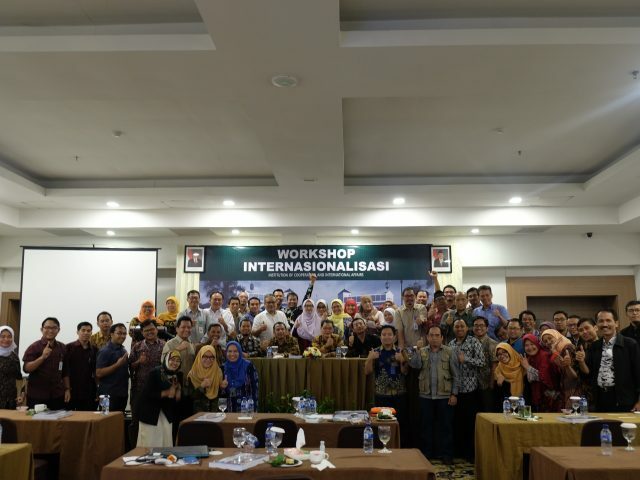 In response to those issues, on Monday, February 12, 2018, UMY Cooperation and International Affairs held Workshop Internasionalisasi in Cavinton Hotel Yogyakarta. Emphasized on how important to implying program based on the standard in Higher Education field as Prof. Dr. Achmad Nurmandi, M.Sc. stated there are still a lot of International Program in Higher Education Field working at the same time disobeyed the applied standard i.e. the Students costs few payments that burdened them whilst the outcome far less from expectation. “to overcome the problem, we offer solutions which widen cooperation, increasing the number of scholarship and fellowship, information development, and also providing Bahasa Course. Even though some problem still present, we do hope there is development to boost lecturer performances and other in our way to Internasionalisasi” added by Executive Director of Cooperation and International Affairs Mr. Eko Priyo Purnomo, Ph.D. as already informed in the discussion despite those things above the University faced the problem in database management, accommodation, and Visa for students. Many solutions offer within the discussion including Website development which believed in this modern era media of the institution could be its front door for the public, so lack of data should not be afforded. At the end, developing E-learning system could be the main key to achieve a better way for the better education system for all.